Sweet Potatoes are a super food when it comes to dietary fiber and nutrients, but also versatile in the kitchen. From making desserts to pie fillings. Here we kept it simple by roasting them whole. The filling is a smokey BBQ chicken mayo toped with crispy Asian salad. Perfect for any time of the day. Marinate chicken with Knorr Chicken Stock Powder, garlic and ginger. Grill chicken over charcoal grill, oven bake or sauté in a pan. Once cooked shred chicken and keep aside. Preheat your oven to 180°C. Scrub your sweet potatoes and pierce the skin a few times with a fork. 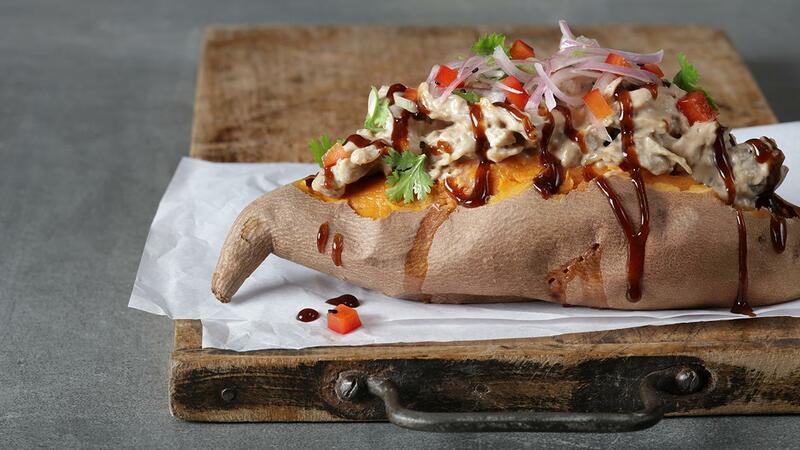 Place the sweet potatoes on a baking sheet and bake for 30-45 minutes, or until they’re easily pierced with a fork. Remove the potatoes from the oven once they’re cooked through, cut open in the middle, and stuff with the barbecue chicken. These are extra delicious topped with a salsa salad.